Amsterdam residents are increasingly visiting green spaces in their neighbourhoods to relax, enjoy nature, play, exercise or meet with friends. Weather permitting, you can even spot more and more people working outdoors, on their laptops, sitting on a bench in the park or on the pavement surrounded bij green walls and trees. Green spaces provide an attractive environment which, as well as many other benefits, offers peace and tranquility. That alone is of great value in an increasingly crowded city. No wonder that fast growing cities around the world are looking for contemporary, creative solutions to add more green space to the urban environment. Some cities, such as Vienna, have adopted quantitative norms to set the required square metres of green space and the minimum distance to green amenities. Would such norms also work in Amsterdam? Is there enough room for more green space in a densifying city? The first article of this issue of Plan Amsterdam discusses Amsterdam’s green space strategy and makes it clear why it’s important to focus on the quality of our existing green space. By improving the quality of this green space more Amsterdam residents and visitors will be able to enjoy it. Amsterdam is growing at a phenomenal pace. So fast that people are already speaking of the city’s third Golden Age. Still, to truly build this third Golden Age, the city will need to use this growth to create a better place for its people. Green infrastructure will play a crucial role in achieving this. Can we make sure we will have enough parks and green areas for Amsterdam’s 1 million plus population in 2034? Will the city have enough quality green space to be attractive, healthy and climate resilient? city with increased levels of crowding, green space has become indispensable. plans for densification and they will play an increasingly important role in providing green amenities for Amsterdam’s growing population. pressure on the recreative and ecological aspects of these green spaces just outside of the city. Green gems For the city to remain attractive for its residents, businesses and tourists, it needs to provide a wide range of high quality green space. The green areas where people can meet up will be mostly situated within the city proper. For people to experience space, peace and quiet, a rural environment and Dutch cultural heritage, as well as to recover from emotional or physical stress or to enjoy outdoor life and nature, we will need green space outside of the city. The more built up the city is, the greener and more accessible the surrounding metropolitan landscape should be. Amsterdam is already surrounded by a number of ‘green gems’ such as the nature areas in Waterland and the Amstelscheg. In addition, there are a number of potential green gems such as the Marker and IJ Lakes area. Together these could form an emerald zone which combines with the green spaces in the city to contribute to a fantastic quality of life. Challenges Although Amsterdam is in an excellent position to achieve this high standard of living for its residents, there are a number of difficult challenges to negotiate: 1	developing a diverse and meaningful green space outside of the city, complementing the green space in the city; 2	managing in a responsible manner the changes in the landscape which are irreversible, including growing urbanisation, soil compacting and ecological decline; 3	significantly improving the landscape’s accessibility; 4	building a future proof landscape which will last for the long term. 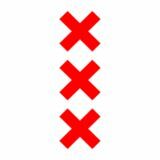 In order to meet these challenges, Amsterdam will have to work with other stakeholders on a regional level. This is because large parts of the countryside, recreational areas, nature areas and farmlands concerned are situated in the region outside of the Amsterdam municipal borders. All Amsterdam neighbourhoods will be turned into green city biotopes The strong population growth within Amsterdam’s boundaries means we need to focus on high quality green spaces closer to people’s homes. Quality of life, climate resilience and biodiversity also give us every reason to look for more nature-based solutions for new as well as existing city neighbourhoods. Landscape architect Ton Muller coined the word ‘city biotopes’ to refer to these green neighbourhoods where people, plants and animals are all given maximum weight. The opportunities and possibilities to realise these green biotopes are plenty, as you can read on page 18 of this issue. It is estimated that Amsterdam has around twelve square kilometres of flat roof space. If we can turn four percent of this available space into green spaces and make these publicly accessible, we will have added a whole new Vondelpark to the city. The good news is that we are actually on course. The target we set in the Green Agenda 2015-2018 to add fifty thousand square metres of green roof space will be met easily. And we now have the opportunity to get it right from the start when we build new residential areas in the years to come. This is why we are working on a set of new green rules and norms to help project leaders, designers, developers and architects to optimise the greening of future buildings and neighbourhoods. providing in all outdoor recreational needs. Amsterdam people will increasingly turn to the areas surrounding the city, where there is still plenty of space to visit an event, grow vegetables, play sports, set up a barbecue or just enjoy the peace and quiet of nature. Especially the green space closest to the city, i.e. the rural ‘wedges’ which cut deep into the city, is ideally suited to add a new type of park to Amsterdam’s collection of green spaces: the metropolitan park. Larger than a city park, the metropolitan park is characterised by combining rural and urban functions. Whereas the green buffer zones surrounding Amsterdam were originally conceived to counter the encroaching urbanisation, the metropolitan park is designed to be a part of the city. This type of park will need to be attractive for both Amsterdam people and people living in the region, and its programme will need to be varied yet always matching with the identity and scale of the landscape. Built around the remains of a steel plant which closed in 1985, the Landschaftspark Duisburg-Nord in the German Ruhr area is a splendid example of a successful metropolitan park. The landscapes surrounding Amsterdam, including Nieuwe Meer, Waterland, Amstelland and Diemerscheg, Spaarnwoude and Twiske, offer opportunities for the city to design contemporary metropolitan parks in collaboration with the relevant municipalities, provincial, leisure and water authorities, land owners and other stakeholders. Such parks would contribute significantly to the quality and economy of these green areas. It will not be an easy task, but it would be a worthy legacy for the third Golden Age to leave behind! Building a green Zuidas district Amsterdam has the ambition to turn its most dense metropolitan district, the Zuidas, into a lively urban area for living and working, with green spaces contributing significantly to a high quality of life. The construction of a tunnel for the A10 Ring Road will deliver a rich green landscape which will assimilate the infrastructure, with green spaces on the car tunnels and the roofs of Amsterdam Zuid rail station’s platforms, in the heart of the Zuidas district. future values). With little public or green space available, the new lay-out of the Zuidas district will be designed with surgical precision and include both the public and private space. The plan’s main focus is on a comprehensive design for the (green) public space. All the issues which are important for the development of the densely built Zuidas are taken into account in this green public space, including the area’s use, climate, drainage and biodiversity. More than just colour But Amsterdam’s ambition extends beyond the central zone of the Zuidas, and beyond merely planting a few trees. The city wants to green the whole of the Zuidas district with a variety of trees, shrubs, herbs, climbing plants as well as various different forms of green spaces, such as green squares, pocket parks, green roofs and patio gardens. The plan provides a framework for the design of the green public space, including targets and concrete measures. It will serve as a link between the city’s comprehensive green strategies such as the Green Agenda and actual designs of specific areas. The plan looks at all types of green space in the area, including metropolitan landscapes, city green space, neighbourhood green space, the greening of specific plots and the connecting networks of green and blue spaces. been taken to steer this process. These include the appointment of a green advisor, an ecological specialist and a green supervisor, as well as collaborating with grid operators, communication with local residents and businesses, including green space in the building envelope and taking into account management funds. These measures should help realise the ambition to give the Zuidas district a green boost. The plan for a green Zuidas makes green space into a defining feature of this dense, mixed metropolitan business and residential area. Maike van Stiphout Managing Director DS Landscape Architects and Head of Landscape Architecture at the Amsterdam Academy of Architecture. “How can we create more biodiversity in a densifying city? How do we build nature inclusive designs, i.e. developments that have more nature than before? With the crisis subsided and urbanisation growing, this has become a hot topic. Earlier in my career I used to do a lot of work in the development of suburbs and new housing within the existing landscape. Now I use this experience, for instance about the laws on the Flora and Fauna Act, in my work in the city. I also frequently take inspiration from abroad. Together with an architect I collect and share expertise and examples of nature inclusive developments around the world, which we publish on the nextcity.nl website. New living environment Nature is no longer the exclusive domain of ecologists. These days, designers, architects, developers and builders need to be aware of the impact they have on every living thing in the environment. Suppose we want to take down a tree. This will change the habitat of people and animals. If we then want to construct a new building on this site, we have the opportunity to add more nature than before. With the building, we can create a new living environment for so-called building-dwelling species such as bats, sparrows and swifts. We – designers, city planners, landscape architects, housing developers – need to take this responsibility, because we build constructions that will last for a hundred years! The city as a rocky landscape Just as we like to have a supermarket around the corner, animals also like to be close to their food. This means that the space is just as important for them as the buildings. I look at a city the way I look at a rocky landscape. Take the Sloterdijk area for instance, a built-up area right between the Westerpark and the Bretten zone. Together with architects I designed a plan to connect these areas. We explored which animal species we would like to attract. It turned out that the area houses some nightingales, an iconic and much-loved bird. So I asked the Dutch society for the protection of birds what nightingales need to survive, and used this information to set up a programme with requirements, including favourite nesting sites, their preferred density of shrubbery, the height of their habitat and where they find their food. With this knowledge all new designs for Sloterdijk can be made to meet the needs of the nightingale and any other species we would like to thrive in this area. The bigger picture Discussing sustainability, people often refer to technical innovations such as solar panels, green roofs, etc. For me, it is the bigger picture that matters. How do we want to live together, not just with people, but also with plants and animals? In the construction industry this can raise some eyebrows, but at the same time I have noticed in recent years that nature is back on the agenda. Especially city dwellers are looking to get into contact with nature. They are starting to realise that nature can add value to their lives in many different ways, as inspiration, to relax, for their health and even in a financial way. To continue living our lives on this planet, we will really need to start thinking about how to promote biodiversity and nature inclusive development.â&#x20AC;? If you leave the busy cycling routes in the centre of Amsterdam, you will find the most amazing green spaces, even in very narrow streets. These green sanctuaries offer peace and quiet, and are often realised by local residents. Combined with municipal policies to increase emphasis on green infrastructure and nature in urban design and policy, an urban nature is emerging that in turn inspires the design of newly built neighbourhoods. Green space is not a static object. It comes in many shapes and forms. It is alive, it changes with the seasons, it stimulates our senses and evokes emotions. Green space has social, economical and physical value, and its role can change in different contexts. This article focuses on green spaces in the cityâ&#x20AC;&#x2122;s streets and neighbourhoods, which are often referred to as urban nature or neighbourhood green space. These green spaces are small-scale and contribute to a pleasant living environment for local residents. They do not include city parks or the larger green areas just outside the city, but comprise the small green spaces which include plants growing against walls, on squares, along trees and on roofs. often dependent on green amenities in the local public space for their ‘green’ recreation. 4	Climate resilience: Climate change is causing more extreme weather such as heavy rainfall and higher temperatures. In an increasingly built-up area these extremes have an even greater effect. More green spaces help to keep homes, streets and squares pleasant despite these changed circumstances. They increase retention and reticulation of rain water and have a cooling effect on high temperatures. 5	Educational and developmental benefits: Especially for young children it is important that they experience nature. A greener living environment, school and childcare facilities can help, offering opportunities for children to learn about nature and experience how they are closely related to it. Green space also encourages physical activity, stimulates creativity and broadens the mind. 6	Health: Green space has a positive effect on our mental and physical health. This is why green spaces in the neighbourhood as well as in healthcare centres, schools and hospitals are so important. Especially socially and economically underprivileged people benefit from a green environment to boost their health, as they have fewer possibilities to unwind, play sports or go out and about. Beneficial green biotopes The idea of the urban biotope is to turn local neighbourhoods into pleasant environments for people, plants and animals, while at the same time retaining the dense, metropolitan character of these districts. The design should be based on a smart interplay between buildings and the public space. Integrating more green space in these designs and making use of all their benefits, they can, for instance, also be used to help birds and bats to thrive. carry out the work, greening their houses, offices, streets or squares. In new neighbourhoods there is now the opportunity to do things right from the start. The first signs of this new approach are already visible in the Zuidas district, but also at Sloterdijk and the Bajes Kwartier area. As existing green, low-density neighbourhoods such as Noord, Zuidoost and Nieuw-West will become more dense, their green space will need to be made more attractive, varied and functional. Recent research carried out in the Nieuw-West area (Droog, 2017) shows that local residents think the green space in their area is boring and anonymous. Green initiatives by local residents and businesses could make the public space in the area more lively and colourful. A need for creative solutions Because of densification and the growing trend of people spending more time in the public space, we will need more green solutions to make or keep neighbourhoods attractive. In a number of Amsterdam neighbourhoods small urban biotopes with inspiring green spaces have emerged, which benefit the living environment in various ways. Not all existing green spaces provide high value. Using creativity and innovation, their value can be increased. Currently, new rules and norms are being established for the design of new neighbourhoods. This offers a great opportunity to create as much smallscale green space as possible in these areas, provided the council, developers, residents and businesses will work together. There are plenty of inspiring examples throughout the city which they can learn from, green spaces which have been initiated by local Amsterdam residents who have been working to green their neighbourhoods for years. They show us the building blocks with which we can green the grey in dense urban areas. 8	The building blocks for a green neighbourhood infrastructure and their benefits. Green building blocks The city needs multifunctional green space which provide multiple benefits. In recent years, much of this valuable green space has been added to the city’s streets, squares and roofs. Below we will outline the various types of green space, which can be considered as the building blocks for greening existing and new neighbourhoods. 11	How much green infrastructure do Amsterdam’s neighbourhoods currently have? Squares and fields Pocket parks and neighbourhood parks These attractive small parks have been designed to invite encounter and activity. More and more pocket parks are initiated and (co-)managed by local residents, frequently with the support of the ‘Park om de Hoek’ project, which is part of De Gezonde Stad. Green play areas and nature play parks These are places for children to discover nature, build huts, run about and relax. Amsterdam has a broad variety of these spaces, ranging from play areas with natural materials to nature parks. Green schoolyards Schoolyards designed as areas to play and learn, such as an outdoor classroom with animals, plants and trees. This type of space benefits not only the school children and teachers, but also the local neighbourhood, especially as more and more schoolyards are made (semi-)public and more accessible. Green play streets In the last decade, a number of streets within the A10 Ring Road have been closed to traffic and turned into green spaces to meet and play. The areas where these ‘livable streets’ have been created also include the Zuidas and the Laan van Spartaan. Buildings Sidewalk gardens As many residents, particularly within the A10 Ring Road, have no balcony or garden, they create beds of plants and/or flowers on the pavements, along the facades of their houses, or tend the bare soil around street trees. You can find these small green gardens in almost every street, adding colour and life to the urban environment in many different ways, ranging from wild permaculture to neatly tended beds of colourful violets. Semi-public and private gardens Across the city, many previously private gardens have been opened up to the general public during the daytime. There are also many private courtyards in the city, which are not always very green or well tended. Greening these courtyards is very important for the city, especially in dense areas where the possibilities to green the streets are limited. Green roofs More and more of Amsterdam’s roofs are being reclaimed for sustainable use. As well as sedum roofs, nature roofs, water roofs and solar roofs, Amsterdam also has many roof terraces, roof gardens and even vegetable gardens on roofs. Roofs which are visible or accessible are of great added value to local residents. Green walls Many of Amsterdam’s facades are covered with climbing plants which grow up from the soil – either with or without support. They can add colour to the streets and they are attractive for wild bees, butterflies and birds. There is also an increasing number of living walls aka vertical gardens, with plants which are not rooted in the open ground. These are more expensive to plant and grow than climbing plants. “Many studies have linked extreme heat in cities to higher death rates. Not only does heat impact on our health, it also affects indoor and outdoor liveability, the outdoor environment, water management and our transport and electricity networks. This is why city councils want to do something about it. However, they do not know exactly what they should do and what their goals should be. One of the questions is how to define a heat proof city, for instance that every resident should live within a five-minute walk from a green environment. We don’t have any such guidelines yet. This is why the Amsterdam University of Applied Sciences (HvA) joined forces with five municipal councils, one water authority and another university of applied sciences to study heat and the effects of heat in urban environments. This study has taught us what we can do to offset the effects of heat and has given us a framework to set norms and regulations. Measurements In the summers of 2015 and 2016 we installed two mobile weather stations at various locations in Amsterdam to measure temperatures. The locations included the IJ, the Vondelpark and Dam Square. We were interested in measuring the cooling effects of green and water compared to grey areas with hard surfacing. In addition, we also compared measurements in the shade with temperatures measured in full sun. And we set actual temperatures off against perceived temperatures, as humidity, wind speed and sun radiation also play a part. Finally, we also studied people’s ‘thermal perception’, i.e. how cool, warm, pleasant or unpleasant they found the weather in these places. Cooling shade One of the outcomes of our research is that shade is very important to dampen heat. Its cooling effect turned out to be much greater than that of water. So if you want to green the city, trees are your best bet, because they provide shade. Grass will be less effective, as it does not provide shade and its evaporating qualities are lost once it has withered because of the drought. Tree leaves, on the other hand, will not wither that easily. So our research has shown that trees are of great value to the city and should not be felled without giving it proper consideration. Of course, it is impossible to plant trees everywhere. Shade cast by buildings also works. And if you green the walls, you will also make sure that they will not get hot very quickly. Building a green city Green legacy of the third Golden Age Amsterdam is growing at a phenomenal pace. In a densifying city with increased levels of crowding, green space has become indispensable. Will Amsterdam have enough quality green space to be an attractive, healthy and climate resilient place to live for its 1 million plus residents in 2034? allotment gardens and cemeteries can be made more accessible to the general public. Other, alternative opportunities include ‘city biotopes,’ green neighbourhoods where people, plants and animals are all given equal weight; and metropolitan parks, which are larger than city parks and are characterised by combining rural and urban roles. Amsterdam’s wealth of parks, trees and valuable cultural-historical landscapes are the legacy of a long planning tradition. During the city’s first Golden Age (from 1588 until roughly 1700) trees were planted in regular patterns along its main roads and canals. Between 1870 and 1930, during the second Golden Age, the city’s parks were developed. From the launch of the General Expansion Plan in 1935 until 1960, the city recorded a population growth of more than ninety thousand people. Green and blue spaces were used on a large scale to structure the city and new city parks were created. The development of a structure of wedgeshaped green areas cutting deep into the cityscape means that city centre residents are within fifteen minutes’ cycling from the surrounding landscape. Green building blocks for city biotopes Small-scale green space contributes to a pleasant living environment, offering a range of positive effects for our mental and physical health. It encourages children to be more physically active and stimulates creativity. Many people depend on green amenities in the local public space for their ‘green’ leisure and recreation. Initiatives to green the neighbourhood can lead to more social encounter, create a tighter knit community and foster a feeling of ownership of the public space. Ecologically designed green space also houses a wealth of indigenous plant and animal species, adding to biodiversity. And it helps to create a climate resilient city, because it increases retention and reticulation of rain water and has a cooling effect during hot summer spells. The city is growing faster than ever before, but we have agreed that we will only build within the existing city boundaries, protecting the valuable green areas surrounding the city. Amsterdam is on course to meet the ambition outlined in the 2015-2018 Green Agenda to add fifty thousand square metres of green roof space. However, if we were to match the growth in population with the corresponding acres of green in 2025, we would have to add almost 1400 acres of green spaces. There is simply not enough space for this within the existing boundaries. The city needs multifunctional green space which provides multiple positive effects. These types of green space include pocket parks, green schoolyards, nature play parks, green strips along the water, green play streets, sidewalk gardens and green roofs and walls. In a number of Amsterdam neighbourhoods, small-scale urban biotopes with inspiring green space have emerged, often as a joint effort between the council, local residents and businesses. The idea of the urban biotope is to turn local neighbourhoods into pleasant environments for people, plants and animals, while at the same time retaining the dense, metropolitan character of these districts. Currently, new rules and norms are being established for the design of new neighbourhoods. By integrating more green space in the designs of buildings and the public space, and making use of all the benefits this green space can bring, we can help wildlife such as birds and bats to thrive. Existing green, low-density neighbourhoods will become more dense. To be able to develop them into urban biotopes, their green space will need to be made more attractive, varied and functional. Students turn off the gas Amsterdam uses a lot of natural gas. Around 90% of heating in businesses and homes is generated by gas. Natural gas has a large share in harmful CO2 emissions. What’s more, the Dutch natural gas reserves are running out. Importing gas from abroad would mean higher home energy bills and would also make the country and our city dependent on other countries. L.A.N.X. is the first Dutch student society to turn off the gas on their premises. Their ambition is to become the Netherlands’ most sustainable student society. The green, sustainable plan for the three historic canal houses occupied by L.A.N.X.’ members has been designed and carried out by De Groene Grachten. 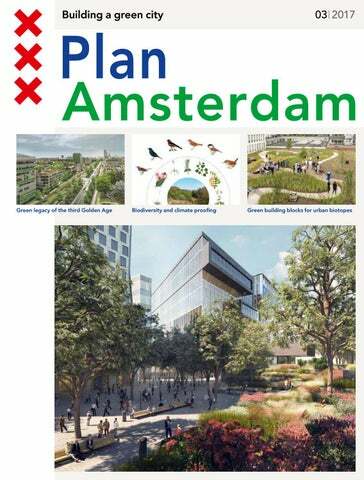 Plan Amsterdam is published by the city of Amsterdam, giving information about physical planning and developments.